While our client is busy viewing our portfolio book of work we are walking the property collecting and gathering all necessary site information to begin the estimation process. Noting the amount and type of materials we will need. We then put together an appropriate project quotation that keeps in mind all our costs – materials, labor, equipment and overhead onsite to present the estimate to our customers right there and then. We use this opportunity to explain our pricing and to go over the construction process with them. Also, use this meeting as an opportunity to answer any questions they may have so that we and the client are on the same page as to what is actually being proposed to them. Ensure the property is accessible for our equipment and discuss with our crews where lighting equipment will be positioned. Go over site preparation and project setup with our crew so we all know what we are doing. Make delivery of and Review and assemble materials and make placement of materials on the client’s property. Install timer controls, Hang transformers, layout cable , distribution/junction boxes, connect wiring, set LED module brightness levels and load balance the lighting system. This may take only 1 day or take several days depending upon project size. Client provides feedback as to brightness levels, design aspects or makes known to us any other concerns at this time. Adjustments are made as needed. Once client is satisfied and signs off on the finished look a project progress payment is due. At this point, the design and build project is in progress – which might include digging conduit and cable into the ground, cementing spread/pathlights in place, making final load balance adjustments. Throughout the entire process, we are in communication with our clients. and near the end of the project, inform our clients of our final work day. Schedule a time for a final walk through. This landscape lighting blog is published by Mike Gambino of Gambino landscape lighting inc. all rights reserved. Mike is a professional landscape lighting system designer/ builder and has been designing, installing and maintaining landscape lighting systems for more than 20 years. 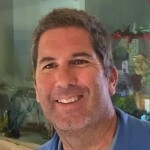 Mike resides in the Los Angeles area with his wife and 2 sons. To visit his website go to www.Gambinolighting.com . To inquire about hiring Mike please click here .